Place a charming sentry at the base of your hedge using this Athens Slate Hedgehog Statue. The alert, forward gaze and raised head of the hedgehog lends plenty of personality to this piece, adding a whimsical hint to your setting in moments. The four feet of this recognizable figure align perfectly with a faux rock, and the gray tone throughout the item furthers the stone effect. Raised spike shapes enhance the realism, and the concrete construction remains durable for many seasons. Place the level base of this statue in your landscaping or yard throughout the warm months, and move it indoors during the colder months to protect it from the elements. Its compact size makes this piece a fantastic addition to a variety of spots, and the gray color and striking detail enhance virtually any setting. 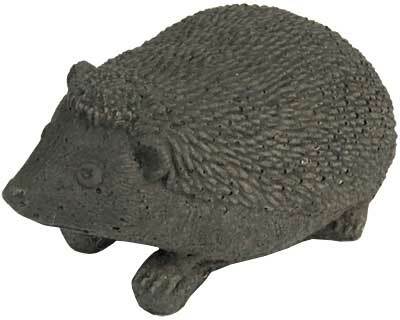 Guard your hedge whimsically with this Slate Hedgehog Statue.